Use the following map to write directions. 1. Write directions to go from the house at 125 Seay Street to the city hall at 171 Holman Street. 2. Write directions to go from the fire station at 2 Cherry Way to the house at 681 Hanover Street. 3. Write directions to go from the restaurant at 15 Elliot Street to the city hall at 171 Holman Street. 4. Write directions to go from the house at 14 Elliot Street to the city hall at 171 Holman Street. 5. Write directions to go from the fire station at 2 Cherry Way to the hospital at 683 Hanover Street. 6. 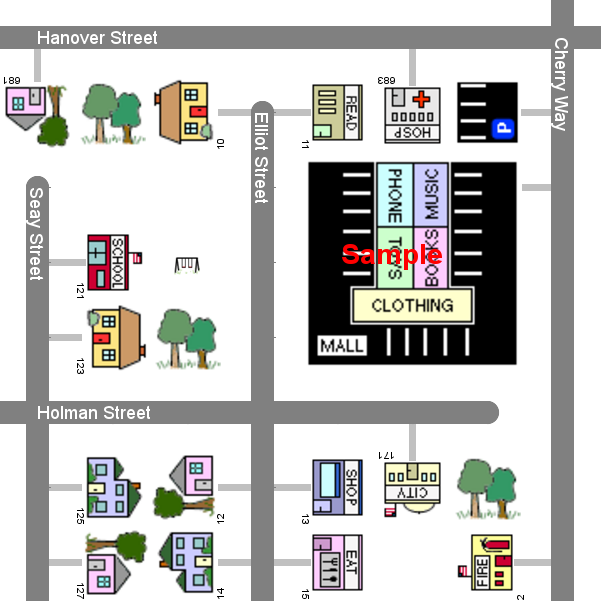 Write directions to go from the house at 12 Elliot Street to the city hall at 171 Holman Street.